Note: If you haven’t set up your colcon workspace yet, please follow this tutorial. To install the zed_ros2_wrapper, open a bash terminal, clone the package from Github, and build it. Note: The option --symlink-install is very important. It allows to use symlinks instead of copying files to the ROS2 folders during the installation, where possible. Each package in ROS2 must be installed and all the files used by the nodes must be copied into the installation folders. Using symlinks allows you to modify them in your workspace, reflecting the modification during the next executions without the needing to issue a new colcon build command. This is true only for all the files that don’t need to be compiled (Python launch scripts, YAML configurations, etc). Note: If you are using a different console interface like zsh, you have to change the source command as follows: echo source $(pwd)/install/local_setup.zsh >> ~/.zshrc and source ~/.zshrc. The ZED is available in ROS2 as a lifecycle managed node that publishes its data to ROS2 topics. You can get the full list of the available topics here. Note: You can set your own configurations modifying the parameters in the files common.yaml, zed.yaml and zedm.yaml available in the folder zed_wrapper/config. For a full descriptions of each parameter, follow the complete guide here. RVIZ2 is a useful visualization tool in ROS2. Using RVIZ2, you can visualize the left and right images acquired by the ZED cameras, the depth image and the 3D colored point cloud. Note: If you haven’t yet configured your own RVIZ interface, you can find a detailed tutorial here. 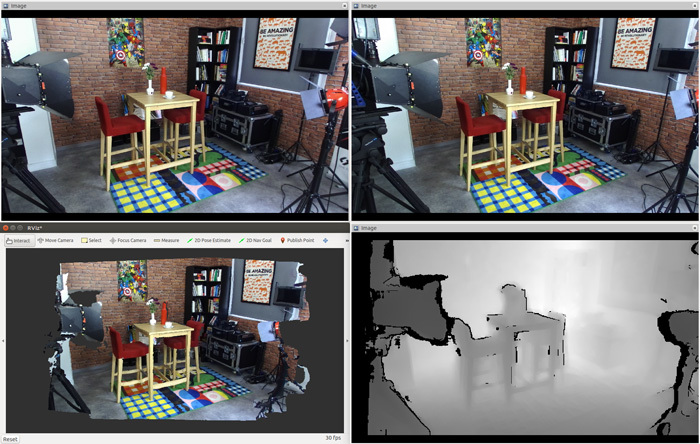 The ZED node publishes both original and stereo rectified (aligned) left and right images. 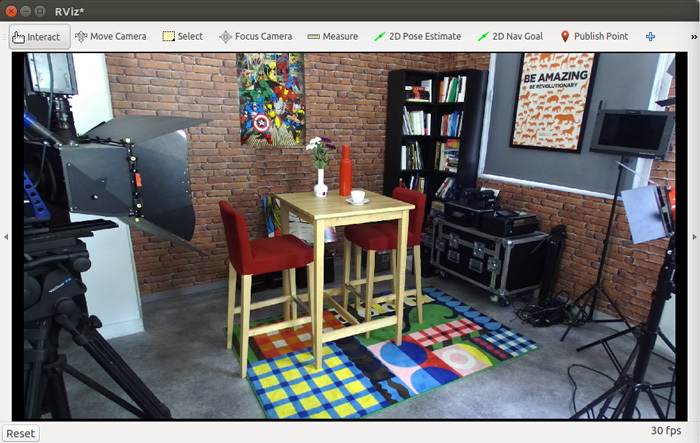 In RVIZ, select a topic and use the image preview mode. Note: The Confidence Map is also available as a 32bit floating point image subscribing to the zed/zed_node/confidence/confidence_map topic. zed/zed_node/depth/depth_registered: 32-bit depth values in meters. 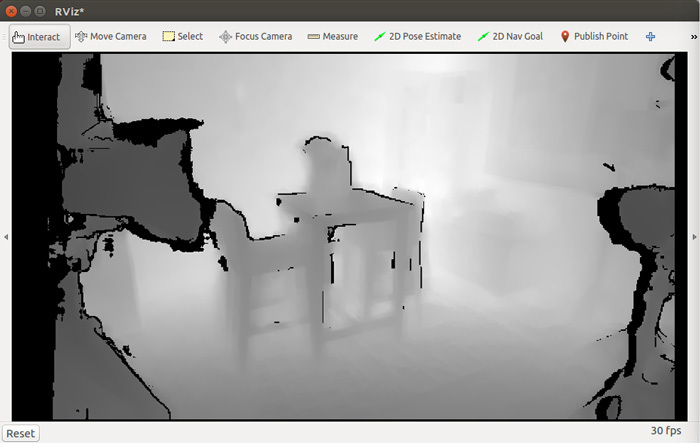 RVIZ will normalize the depth map on 8-bit and display it as a grayscale depth image. Note: An OpenNI compatibility mode is available modifying the config/common.yaml file. 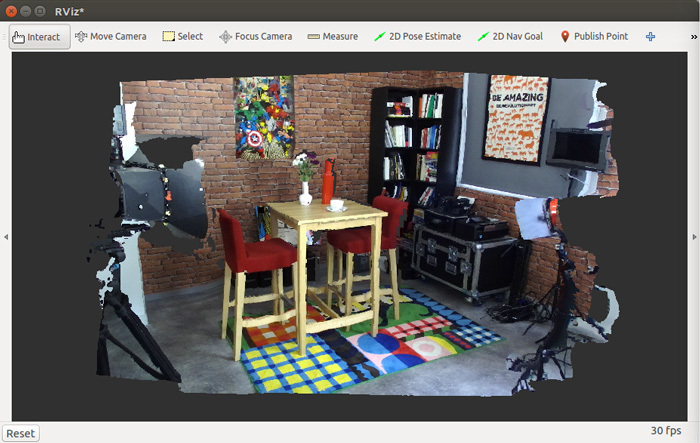 Set depth.openni_depth_mode to 1 to get depth in millimeters with 16-bit precision, then restart the ZED node. A 3D colored point cloud can be displayed in RVIZ2 subscribing to the zed/zed_node/point_cloud/cloud_registered topic. Add it in RVIZ2 with point_cloud -> cloud -> PointCloud2. Note that displaying point clouds slows down RVIZ2, so open a new instance if you want to display other topics. Important: By default, RVIZ does not display odometry data correctly. Open the newly created Odometry object in the left list, and set Position Tolerance and Angle Tolerance to 0, and Keep to1. With the ZED, you can record and play back stereo video using Stereolabs’ .SVO file format. To record a sequence, open the ZED Explorer app (/usr/local/zed/tools) and click on the REC button. To launch the ROS wrapper with an SVO file, set the path of the SVO in the launch parameter general.svo_file in the file config/common.yaml. Note: add a # in front of the general.svo_file parameter to use an USB3 connected device, YAML does not allow to set an empty string parameter. Important: Use only full paths to the SVO file. Relative paths are not allowed. depth.confidence: Sets a threshold that filters the values of the depth or the point cloud. With a confidence threshold set to 100, all depth values will be written to the depth and the point cloud. This is set to 80 by default, which removes the least accurate values.